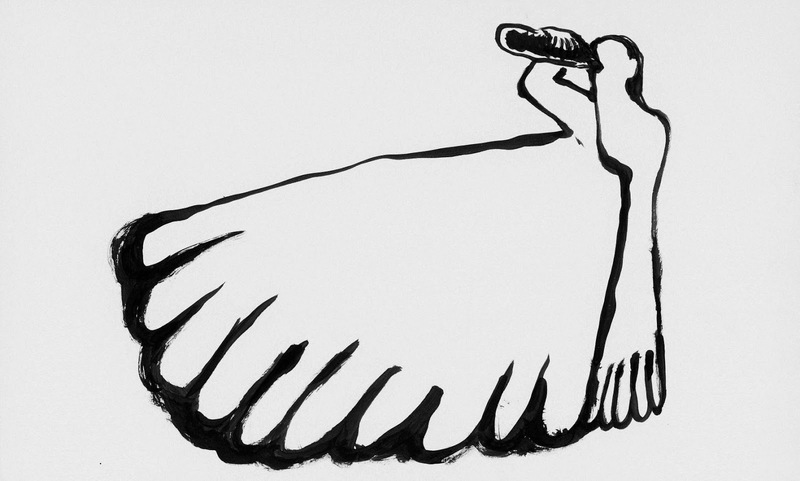 The shorts at the Ottawa International Animation Festival have a flair for the dramatic in Short Film Competition 2. This programme features all the vibrant colours and dazzling animation one hopes to see at the festival, but these films pack a bit more of a punch. Take, for example, Priorities (Gints Zilbalodis, Latvia), the film that opens the programme. Priorities is a gripping adventure about a pilot stranded on a desert island with his trusty dog. Priorities offers a two-hander that connects the audience to the unnamed pilot and his energetic golden retriever simply by giving the pair equal time as they fight for things that matter—he builds a raft while doggy wants to play. Director Gints Zilbalodis makes the film so involving, though, by complementing the wordless relationship of the pilot and his best friend with an observational perspective that resembles a handheld camera. The effect creates a first-person perspective that injects the viewer into the film as a third party invested in the pair’s survival. This impressive film gets SC2 off to a great start. Another colourful animal drives Nuggets (Andreas Hykade, Germany), a hilarious short, which, like Priorities, manages to effect the audience without uttering a single word. The film takes a simple premise of a bird that samples droplets of golden nectar along its journey. The golden nuggets give the bird a high, but the ample calories of the tasty findings steer gravity outside his favour. Sip upon sip makes birdie extra plump, so Nuggets amusingly takes the audience through the bird’s sugar highs and loads as it fattens him up for the consumers. Chicken nuggets will never taste the same. Soif. Photo courtesy of OIAF. If the birdie’s eager slurping leaves viewers thirsty, then Soif (Michèle Cournoyer) comes along to slake them of their craving. Soif is one of two National Film Board of Canada flicks in the programme the other is lovingly nostalgic Rainy Days (Vladimir Leschiov, Latvia/Canada), which evokes stirring emotions thanks to its wistful palette. Soif, on the other hand, performs an intricate ride with minimalist drawing of black ink on a white canvas as Cournoyer turns water into wine by melting shapes and forms. The effect creates a hypnotic water cycle, a kaleidoscopic waterfall (minus the colour spectrum, of course), that creates a full range of the elements only the bare elements of animation. Drink it up. OIAF fans drinking up the propaganda juice on the Kim Jung III train will enjoy another helping of parody in Heaven’s Countryland ‘Part 2: The Death of Kim Jung III’ (David O’Reilly, USA), which roasts the Asian dictator with a rapid-fire rat-a-tat-tat. The jokes come faster than one can read the subtitles, but the breakneck speed is half the fun. Broken necks and death figure also prominently in the morbid experimental film Yield (Caleb Wood, Canada). Yield offers a quick montage of road kill spliced together in rapid succession. The grisly images aren’t for the squeamish, but it’s remarkable to see a filmmaker literally animate the dead merely through the tempo of the editing. Pineapple Calamari. Photo courtesy of OIAF. SC2 goes from serious to silly with the uproarious Claymation film Pineapple Calamari (Kaisa Nalewajka, UK). This unconventional love story puts a racehorse in an awkward position when its owner loses her girlfriend and sees her four-legged friend as the perfect substitute. 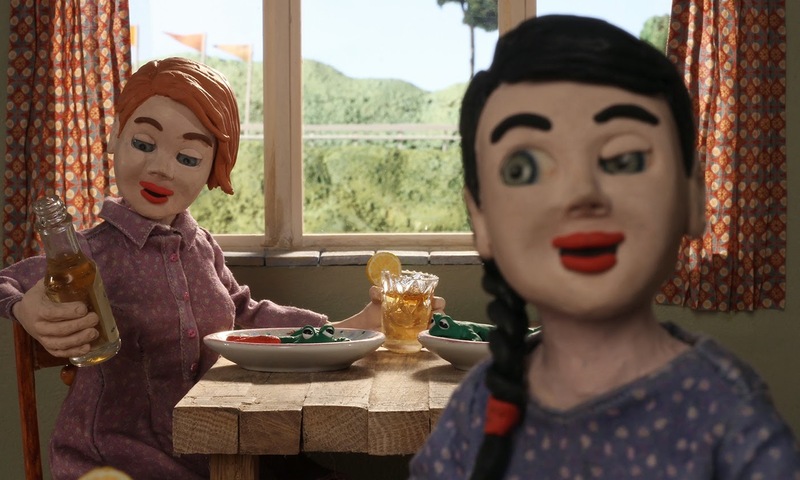 The childlike clay of the stop-motion animation accentuates the quirkiness of this bestial love story with every long pause and jerky tick. The gaps are a blessing that provide a beat for chortles of laughter as the horse finds itself in all sorts of random (and ill fitting) anthropomorphic gags. Pineapple Calamari (don't ask about the random title) probably holds the frontrunner spot for the audience award since it had the packed crowd at the ByTowne busting into booms of laughter. It deserves the prize if it wins. This short is very original and very, very funny! Horses have their day again in the punny Horse Throat (David Barlow-Krelina & Jenna Marks, Canada), a droll comedy of manners that’s doubly impressive for something done in forty-eight hours. 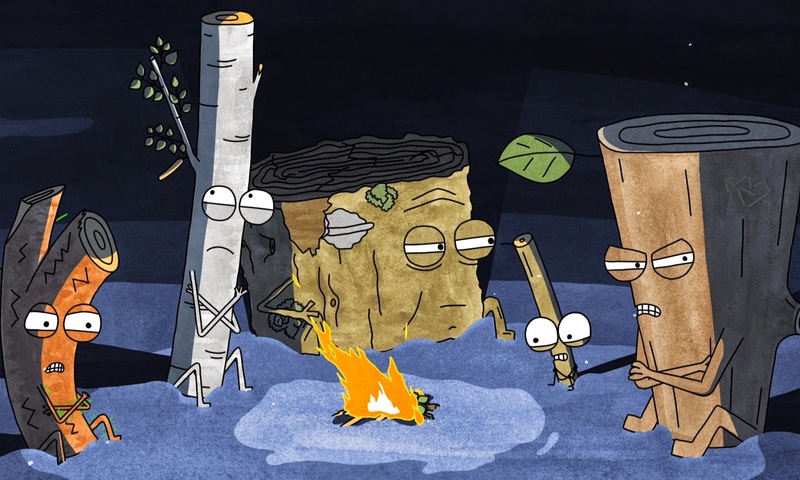 Another funny short, which gives Pineapple a fair fight for first place in the programme is the wickedly funny Timber (Nils Hedinger, Sweden), which envisions a fireside battle to the death. There’s some stiff competition among the four logs freezing to death one cold night, but one log starts playing with fire and the camaraderie goes up in flames. Timber shows that a single original idea makes for a great film as the logs thwart each other in a hollow competition. This clever film offers fun Loony Tunes violence with a twist! Short Film Competition 2 screens again on Saturday, Sept. 20 at 3:00 pm at The ByTowne.